Hotel Galvez & Spa, A Wyndham Grand® Hotel, announced that a watercolor by Crosby artist Gabrielle McNeese entitled “Starry Skies over the Gulf” is the official commemorative poster for the Hotel Galvez Centennial. Earlier this year, McNeese’s painting was selected from 42 submissions in Hotel Galvez’s Centennial Poster Contest. 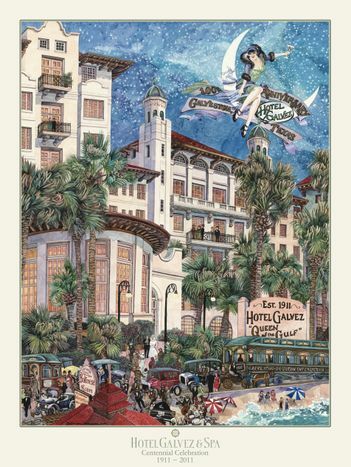 McNeese’s work depicts a fanciful image of Hotel Galvez and incorporates other popular Galveston images such as the trolley, the Galveston-Houston Interurban Train, the Balinese Room, antique cars, elegantly clad guests and a roaring 1920s gal named “Galvie Stone” sitting on the moon holding a martini glass. McNeese will sign her commemorative poster during the hotel’s centennial weekend celebration on Saturday, June 11 from 1 to 4 p.m. in the Sweets Shoppe tent in Centennial Garden. Posters will be on sale for $10 and are currently available in the hotel’s gift shop along with other commemorative items. McNeese and her husband have lived all over the country and moved to the Texas Gulf Coast in recent years. After moving to the region, she and her husband discovered Galveston Island and “have learned new and fascinating things about the island with each visit,” she says. She has had a love for art since childhood and attended the American Academy of Art in Chicago to study advertising and illustration. Hotel Galvez & Spa will commemorate its 100-year reign as “Queen of the Gulf” with a free community celebration on Saturday, June 11. The grounds of this historic beachfront hotel will come alive with family activities and live music during the day and will culminate with a fireworks show over the Gulf of Mexico. For more information on the Hotel Galvez Centennial, visit www.HotelGalvez100.com. The Hotel Galvez & Spa, A WyndhamGrand® Hotel and National Trust Historic Hotel of America, is the only historic beachfront hotel on the Texas Gulf Coast. The Hotel Galvez, rated four diamonds by AAA, is owned by Galveston preservationist George Mitchell and is part of Mitchell Historic Properties. For reservations, call (800) WYNDHAM -- (800) 996-3426 -- or visit www.WyndhamHotelGalvez.com.